Pondering this, I couldn't come up with a single destination. There are so many places I hope to go! So I thought about what environments I enjoy. since landscapes and seascapes are not something I paint regularly. Then what came to mind is how lovely it is to be in a garden! don't take the time to stop and soak up the beauty. lovely England where they are passionate about gardens. . . I am linking this to Paint Party Friday as well as Inspiration Avenue. when I did these pages in a board book last year. I still have 2/3 of the book to complete . . .
this reminds me that I should get back to it! Visit Inspiration Avenue and Paint Party Friday ! giving us a peek at what they've been up to lately. Inspiration Avenue is having a party! I'm off to take a look! Lovely garden! I can imagine being a tiny person in that tiny chair hidden under huge flowers! What a great place that would be! Sweet place to settle in! A nice comfy chair! 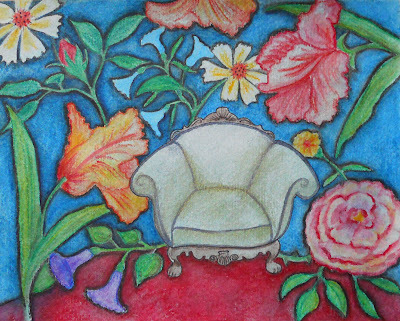 I'd love to go plop myself down in that wonderful chair and look at your lovely garden! 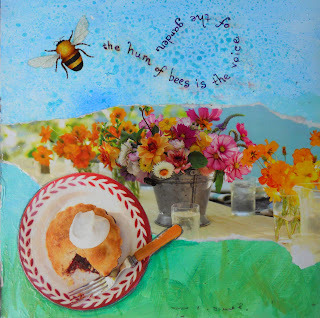 Fabulous use of collage and painting! Happy PPF! 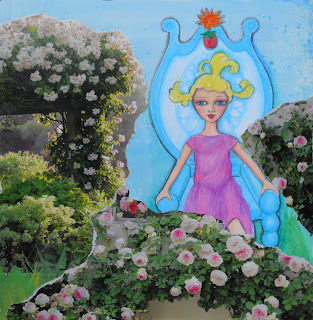 Love your Twilight Garden painting! Looks like a delightful place to sit and reflect! Wonderful! I love the couch right in the middle of the garden! What great juxtaposition, and it really works. What a gorgeous garden collection! I was here yesterday but had to wait til today to leave a comment. My garden has gotten out of hand this summer....can't wait for fall to whip it back into shape! P.S. Angie's book should be in your hands sometime today; enjoy! Pretty place to be, very unique piece too!! Well done! I love your post and paintings. I'm an avid Gardner myself and feel so at peace in nature. Thank you for this. Oh, that looks like a great place to sit down for a few hours!